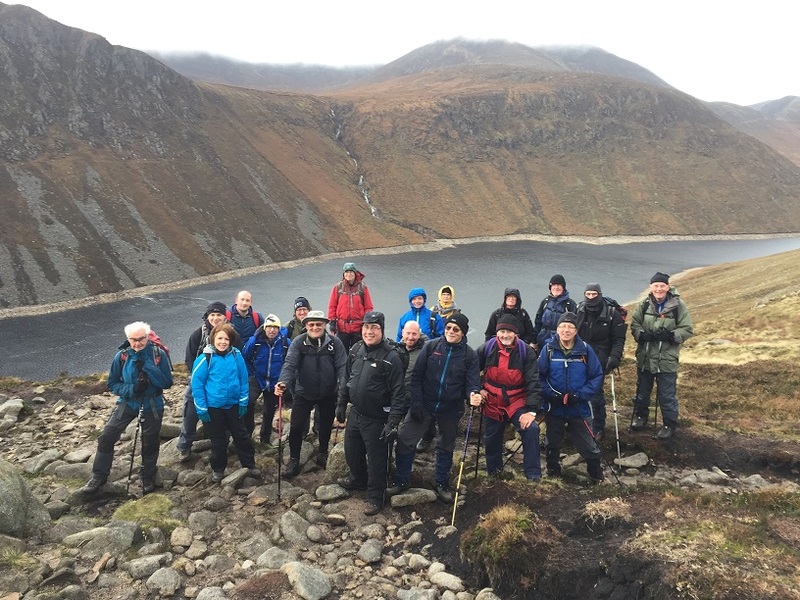 Twenty three of Outdoor Recreation NI’s volunteer rangers attended the annual winter walk on Saturday 12th November in the Mournes with one of the rangers coming from as far as Bushmills to attend. The group started off the day by fueling up at Nikki’s Café in Newcastle before heading to Carrick Little Car Park, the starting point of the walk. The walk was led by Fiona Mullan, an internationally qualified Mountain Leader from Mountain Sojourns with help from walking guide Alison Clarke. From Carrick Little, the group made their up the Annalong Valley before visiting and learning all about the Percy Bysshe Cave which is named after the English poet Percy Bysshe Shelley who is believed to have visited the area in the early 1800’s. After visiting the cave, Fiona and Alison led the walkers to Blue Lough after which they made their way to the col between Binnian Mountain and Slieve Lamagan before descending down to Ben Crom. At Ben Crom, the group stopped for a quick bite of lunch just as the sun was coming out. The final part of the walk involved walking down the tarmac road to Silent Valley, on the way the group passed the Binnian Tunnel which main purpose is to divert water from the Annalong Valley to the Silent Valley Reservoir. Before departing from Silent Valley Car Park, a visit was made to the Silent Valley Information Centre which tells the story of the Silent Valley via an exhibition.